You might have seen me ask a few questions the last few days. Basically, I'm just looking for advice on how plausible this (very early prototype) map might be. Disclaimer: I unfortunately know rather little when it comes to map-making, so please feel free to rip it to shreds. That being said, I'm not going for pain-staking realism, but as much as possible would be good. I am completely fine with moving things around, changing landforms, altering the very nature of the planet, etc. 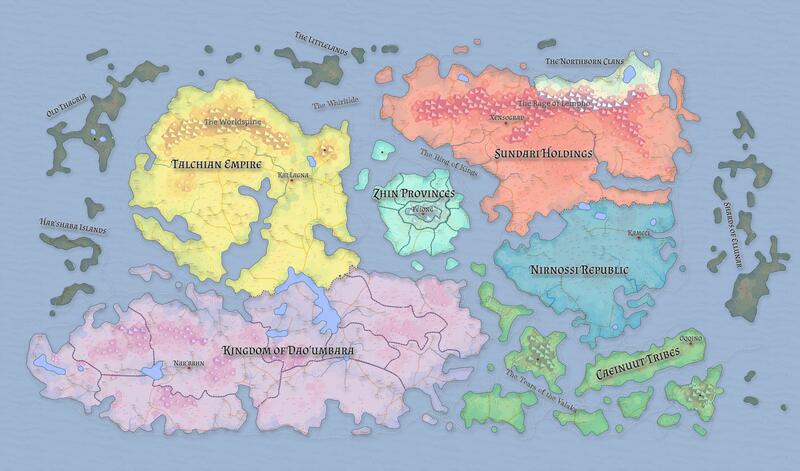 The middle, teal area ie Zhin Provinces are supposed to be mostly temperate/warm-temperature zones. The yellow Talchian Empire is supposed to be more mountainous and cold near the top but more livable near the the area where it meets the purple kingdom. Think almost Canada-like, though perhaps not quite so cold near the top. The triangular shapes in the brown area are mountains. The purple Dao'umbara kingdom is very much based on the middle-east in terms of climate, but more specifically Egypt for the most part. Desert lands and all that. The green Tears of the Valaka are a bunch of islands that are mostly environmental anomalies due to them having power over the elements. So some are tropical, others are volcanic islands, and others near the bottom are far colder. The blue Nirnossi Republic is temperate, almost Mediterranean in terms of climate for the most part, though there are arid areas further down. There may be twin moons in this world, though one can be larger than the other. I'm not entirely sure how this would affect the way the world should have evolved except for their effect on tidal forces. The two large continents were once, thousands of years ago, attached together both above and below the Zhin Provinces, to essentially put the teal kingdom / Zhin in the middle of a sort of in-land sea. I can already see specific errors I'll need to correct, such as the climate disparity between the desert kingdom and the Mediterranean kingdom, probably issues with land-forms not being realistically designed or spread out enough, etc - I actually did want to split all of the continents apart more, but this Fantasy Map Creator doesn't allow for that. I also did not use Plate Tectonics to plan this out. I might redo it with them in mind. Geography on earth is the result of billions of years of weathering, plate tectonics, and many other factors. In this regard, geography is much like a story. One can create an arbitrary configuration of continents, mountains, lakes, streams, plains, hills, etc then create a history using natural geological processes to create those features. Want big craggy mountains? Easy. Have a big ice age or two with plenty of glaciers to cut them through the rock. The geopolitical portions of your map don't make as much sense to me. For example, the green country would have colonies on the shores of the blue and purple countries but I don't see any. This means that there's some kind of political agreement to not have colonies there or the blue and purple countries are strong enough to prevent from those colonies from forming. Clearly, the green country is a seafaring country as they maintain extensive island territories. Why can't they start some colonies on foreign shores? In general, national boundaries form along natural borders such as mountain ranges (India, Nepal, China) or along rivers (Rio Grande river between US and Mexico) or constriction points. The boundaries between the yellow and purple countries makes sense. The extra long boundary between red and blue doesn't make sense. If I were in charge of securing the red-blue border, I would want it to be as short as possible so I can put more troops in a smaller space instead of spreading them out. Depending on where exactly the equator is, much of this planet will be arid or desert. The coastlines where the winds come off the water will be green with plenty of rain. In-land areas (of which this map has many) will be drier or outright deserts. The map has a lot of land and not much water. Reading up on the prevailing winds on Earth will go a long way towards informing your ideas of which climates will be where on this planet of yours. Plate movements on the scale used on this map indicate millions or tens of millions of years worth of movement, not a few thousand. Judging by the fact that a lot of these are kingdoms or empires, I'm assuming the world is pre-modern. These factions are much too large for pre-modern control. Modern countries can handle being so large because we have sufficient infrastructure. We have nice roads and railroads which allow our militaries to cross continents in days. We have electronic communication to allow the central government to easily contact the farthest outposts in an instant. None of these lakes have any outlets as far as I can tell; at least some of these will end up being extremely salty and dead. If you add any outlets, note that a lake will only ever have one outlet of any importance. I don't see any fjords, which tells me your world never had an ice age. The mountain ranges don't seem to be placed along tectonic plate boundaries. In real life, most (maybe all?) mountain ranges are along convergent plate boundaries. There might be a mechanism I'm unaware of to create mountain ranges in the middle of a plate, so I won't say it's definitely a problem. The Zhin Provinces would have more extremes between summer and winter. Due to the lack of oceanic currents surrounding the continent / island, the climate would resemble that in Siberia. January averages about −20 °C (−4 °F) and July about +19 °C (66 °F) while daytime temperatures in summer typically are above 20 °C (68 °F). If you look at a globe, central Europe is located at the same longitude as Siberia, but has much milder temperatures due to the Gulf stream. Your land masses are packed so tightly that there probably would be no big oceanic current between all of the eastern and western land masses. Not the answer you're looking for? Browse other questions tagged reality-check magic alternate-worlds map-making or ask your own question. Is my biome placement realistic? What determines the number of cities and polities present in a given land area?